Monitoring website analytics is an absolute must when driving to have an online presence. Data intelligence give you the opportunity to better understand your target audience. You will be able to see—in most cases—exactly where they drop out or where they hook into your content. 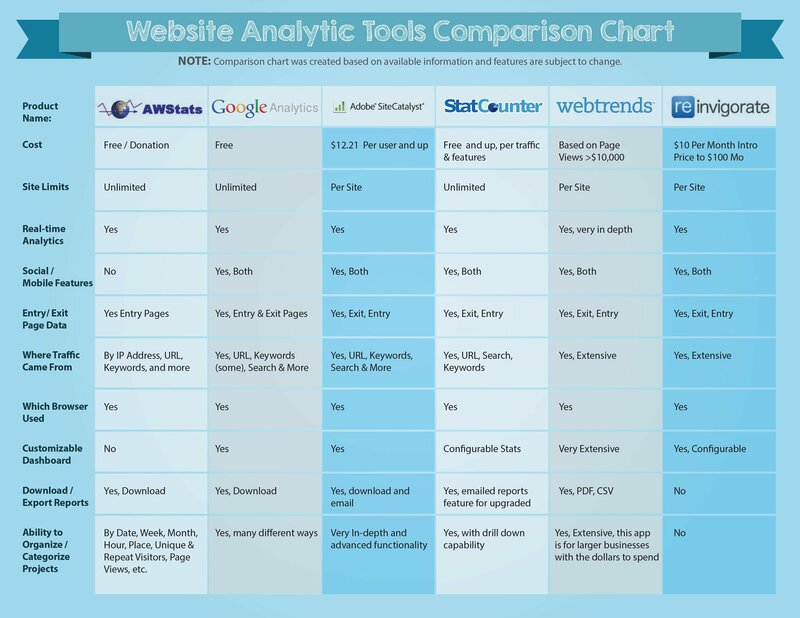 Here are 6 website analytics tools you can start using today! Awstats which costs a grand total of $0. You can give donations to site if you want to, but there is no fixed cost. But if it’s free, it must have limitations, right? Awstats is a fully comprehensive, real-time analytic tool. Awstats has the ability to know where web traffic comes from using the IP address, URL and keywords searched, and it can determine what type of browser is being used. As a user, you can download and export reports, and organize projects by a number of factors including date, location, unique versus repeated visitors, page views, etc. Awstats is already implemented with your hosting installation if you have a Cpanel based host. The most well-known of the free website analytic tools, Google Analytics has no site limits and is able to do real-time monitoring. It has both social and mobile applications and tracks both the entry and exit pages of a particular website. Google Analytics also has the capacity to know if online traffic is coming through a direct URL, keyword search, etc. and what browser is being used. .
Customize your dashboard as much as you like and download or export reports as they’re needed. In my opinion one of the best, if not the best, tool to use given its versatility and lack of cost. Adobe Site Catalyst is a paid tool and it costs $12.21 per user. It is limited to a particular site and if you wish to analyse more sites, the user must contact Adobe directly which is a huge pitfalls. From a functionality perspective, Adobe Site Catalyst has real-time analytics as well as social and mobile functions. It can analyse the entry and exit page of any site and has the capacity to know the browser used and where the traffic is sourcing from. Customise your dashboard, categorize projects or download and export emails. Buyer beware, this is a tool for the technically savvy so if you’re not an analytics buff or a decent sized organization, Adobe Site Catalyst probably isn’t for you..
As free analytics tools are concerned, Statcounter is one of the best. It has no site limits on analyses, both social and mobile features, entry and exit tracking and traffic source monitoring. To top it all off, it can identify what kind of browser is being used. All reports from Statcounter can be emailed and downloaded and the dashboard allows for configurable statistics. You can choose how to organize projects with drill down capability. WebTrends is a unique website analytics tool in that it charges by the number of page views. If you run the type of site that generates a lot of traffic know this: the maximum WebTrends can charge you, no matter how many page views you receive, is $10,000. Though WebTrends is limited to one site, it is capable of an in-depth, real-time analytics, paired with social and mobile features. Like other tools, it analyses entry and exit data identifies the origins of online traffic and detects what type of browser is being used. Download reports in PDF or CSV files and organize projects as extensively as necessary. The bottom line is this: WebTrends is a high-end , big-ticket web analytics tool, with full end-to-end functions and service. Normally this tool costs $100 per month, but they offer the first month at the paid-trial price of $10. Are there any site limits? Yes. This tool works for a specified site. If you wanted to analyse more than one site, then you have to contact Reinvigorate directly so they can upgrade your subscription. Does this site have real-time analytics? Yes. It also has social and mobile features. It analyses data entries of each site, including the entry and exit pages, and performs extensive research on where traffic is coming from. Though the dashboard is configurable, reinvigorate does not allow the downloading of reports or the organization of projects. Reinvigorate is a one stop shop for big data requirements. Though it’s a big- ticket solution with a monthly price tag of $100 users get a full suite of analytics services..
For a small business, Google Analytics—once set up properly—will provide more than enough data for any operational needs. Consider Reinvigorate only if you’ve surpassed the small business threshold. Below is a summary of the comparison. But I would love to hear from you and your experience with website analytics tools… Any comments?